Home / Abundance • Bend Advertising • Bend Events • Bend Health & Wellness • Bend Meetups • First Friday Art • Giveaway • Healers Fair • Health Events in Bend • musings • Therapy • Women's Health / Giveaway! “Prayers of Honoring GRIEF” to giveaway!!! We are over the moon excited to be featuring Pixie Lighthorse for the 3rd time in our Fall Bend Health Guide, this time speaking about Grief. Her Shamanic Teachings & musings heal the soul, we are blessed to have her right here in Central Oregon. 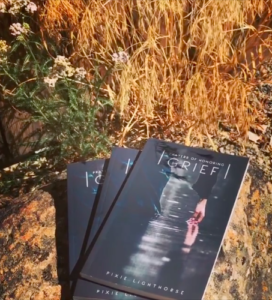 Leave a comment in the blog about Grief for a chance to WIN one of 3 Books we will give away, one will be given here on the blog, one on Facebook & One on Instagram, try all 3 places if you like. Meschell Anderson Grief is all the extra love you have for the one that left and it is like an ocean; it will come on in waves and ebbs and flows like the tides. Emily Wiggins Grief affects us on a physical and emotional plane and I almost always find it affects my patients health in some way. I love helping people process grief through the lungs and with homeopathic support. It often leads to such a shift once past griefs have been allowed to fully move through and be released for a person. Julie Tartak Grief for me is the acquiescing of recognition that something has changed in my heart. Whether it be physical, emotional, spiritual, mental, it’s the absolute shift that things will be different from that point of recognition on.. It’s allowing myself to feel without limitation, expectation or judgement and time constraints. It’s my souls knowing, it creates the natural season for caring and tending. Grief for me is letting go and feeling all the feelers, lovingly. What say YOU about Grief? !